'Very open, bright and spacious. We didn't want to leave!' (another satisfied renter). Why settle for an ordinary condominium when you can get the BEST!! Deluxe condominium that comfortably sleeps seven located in a quiet, scenic locale just three miles from the Dillon Exit of I-70. Free WiFi and a reserved covered parking spot along with plenty of open air parking in the lot in front of the condo. This condo has all the comforts of home (without the stress). Included are: Two queen-size and two twin beds, all with goose down duvets as well as a full-size convertible futon. Leather sofas, three TVs, including a large one in the living room with a DVD/VCR. A GOURMET-EQUIPPED KITCHEN complete with top-quality cookware, Dansk dishes and wine glasses, Henckles carving knife set, lots of serving pieces, and even spices! Of course, there is a fireplace and a gas grill on the south-facing deck with incredible views of the mountains and woods. We looked long and hard for this special site!! Just steps away is a club house with two large year-round hot tubs. Outside the door are cross-country skiing and hiking trails. There is a FREE shuttle bus on-site that will take you to four near-by ski areas: Arapahoe Basin, Breckenridge, Keystone, and Copper Mountain. The shuttle also goes to Silverthorne for its renowned Outlet Shopping Mall and its fabulous Recreation Center with three indoor pools and exercise facilities. My husband and I have two small children and live in Boulder, Colorado. We love the mountains and try to get up there as much as possible!! We rented for years and never were completely satisfied so we made the condo our home away from home. We have a fully-stocked kitchen along with free high-speed internet access and comfotable furniture. 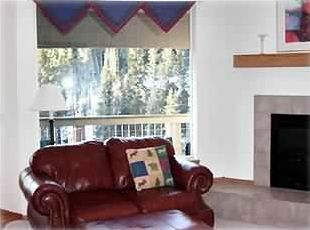 We put in many hours to make our mountain home a place where renters would feel welcome and have an enjoyable vacation! We love the fact that there are incredible hiking and cross-country ski trails just steps from our front door! Our condo is surrounded by wilderness so we see elk, fox and sometimes an occasional moose from our relaxing south-facing deck!